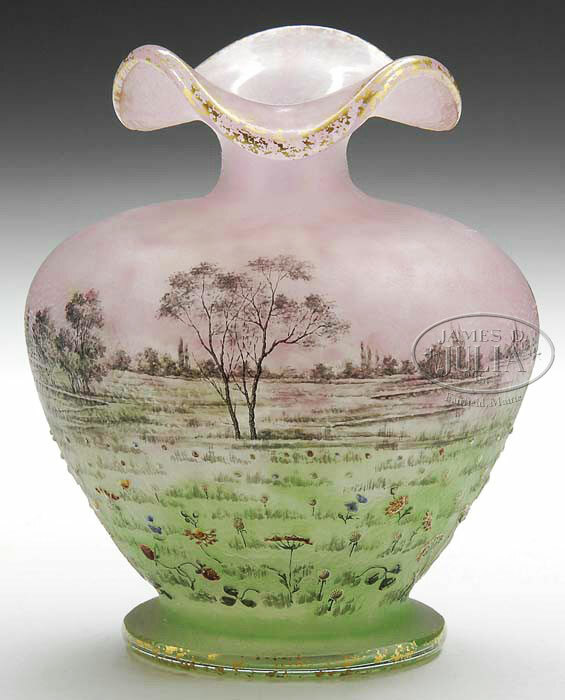 James D. Julia, Inc. held their Important Lamp & Glass sale on June 20-21, 2012. The results weren’t stellar, but not terrible either. A fair number of items did not reach reserve, but those items that did sell added up to the respectable figure of approximately $1.1 million. The top Tiffany Favrile glass lot of the sale was #2366, a 12″ black vase with busy blue decoration around the shoulder. Estimated to sell for $10,000 – $15,000, it more than doubled its low estimate to sell for $25,300, including buyer’s premium. French glass did OK at the sale, with a rare Daum Nancy Prairie vase, pictured on the cover of the catalog, leading the way. Sold as lot #2141, it sold within the estimate of $10,000 – $15,000 to reach $14,950. Prairie vases are rare, beautiful and desirable. This example was fresh from a private home. Moser glass has been selling well at auction for about a year. This sale was no exception, with strong prices, mostly above the high estimates. Lot #1458 brought the most money, though within the estimate of $20,000 – $30,000. Even with a professional restoration to the foot, it realized a price of $26,450. For the complete results of the sale, you’ll have to sign in to the site. Click on the following link. Julia’s Important Lamp & Glass results. 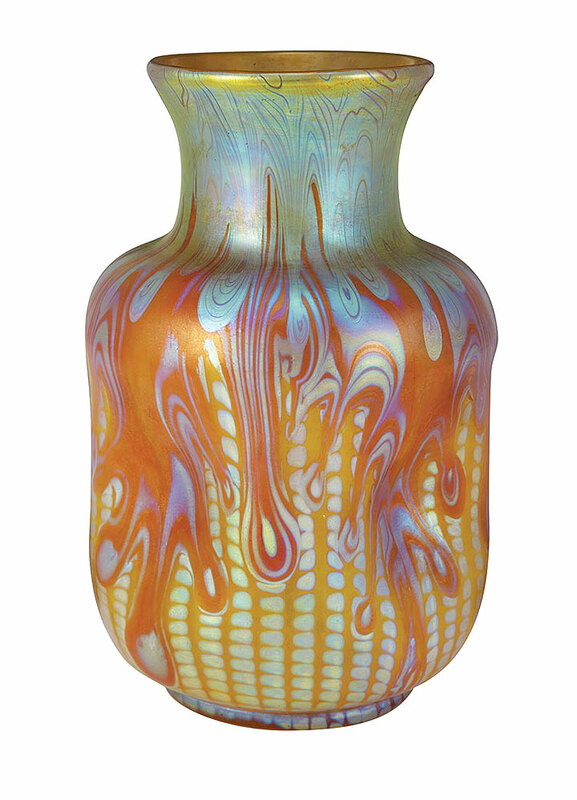 Bonham’s New York held their 20th Century Decorative Arts sale on June 12, 2012, with fair results. There were a few good sales, but more than a few items went unsold. Sotheby’s and Christie’s held their 20th Century sales in the two days following Bonham’s, with considerably better results. 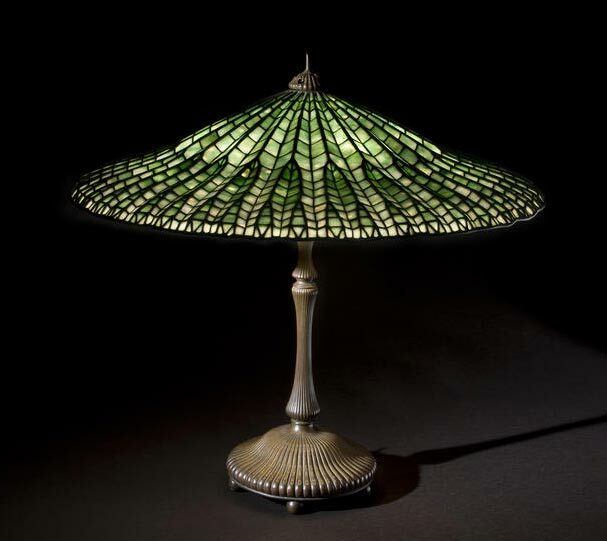 Top lot of the Bonham’s sale was #4061, a Tiffany Studios Lotus table lamp. Estimated to sell for $80,000 – $100,000, it squeaked by to sell near the low estimate, reaching $92,500, including buyer’s premium. Second best lot of the sale was an Art Deco 24½” bronze and ivory statue by Demetre Chiparus, entitled Dourga. It soared past its pre-sale estimate of $25,000 – $35,000 to sell for $88,900. That continued the decade-long strength by important Art Deco bronze and ivory artists like Chiparus and Preiss. René Lalique glass sold well, also showing continued strength. 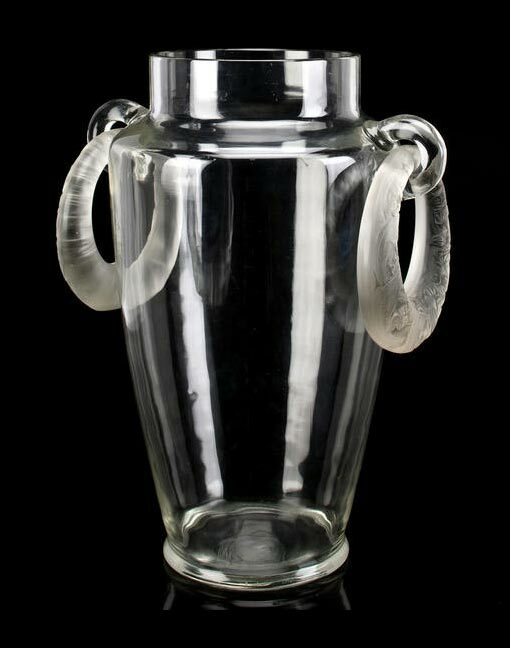 Top Lalique lot was #4195, a rare frosted glass two-handled vase, Deux Anneaux Lizards. It was sold privately after the auction for $20,000, against an aggressive estimate of $20,000 – $30,000. Thursday I’ll cover James D. Julia’s Important Lamp and Glass auction that took place on June 21. Christie’s New York held their Important 20th Century Decorative Art & Design sale on June 14, 2012. 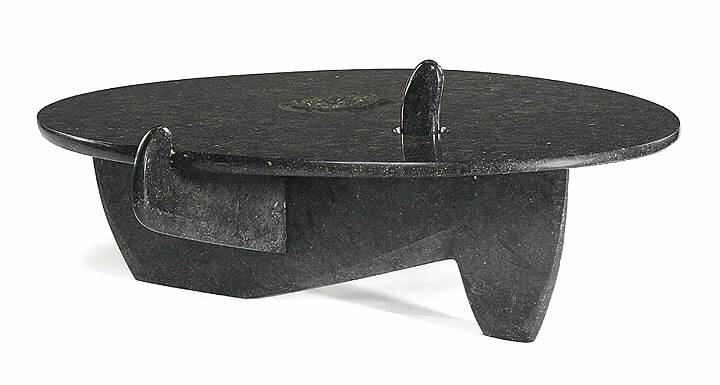 A unique marble table by Isamu Noguchi, lot #175, commissioned for the Chappaqua, NY home of Mr. and Mrs. Samuel C. Dretzin, 1948-49, led the sale with an impressive result. Estimated to sell for $800,000 – $1,200,000, it more than doubled its high estimate to sell for $2,882,500, including buyer’s premium. 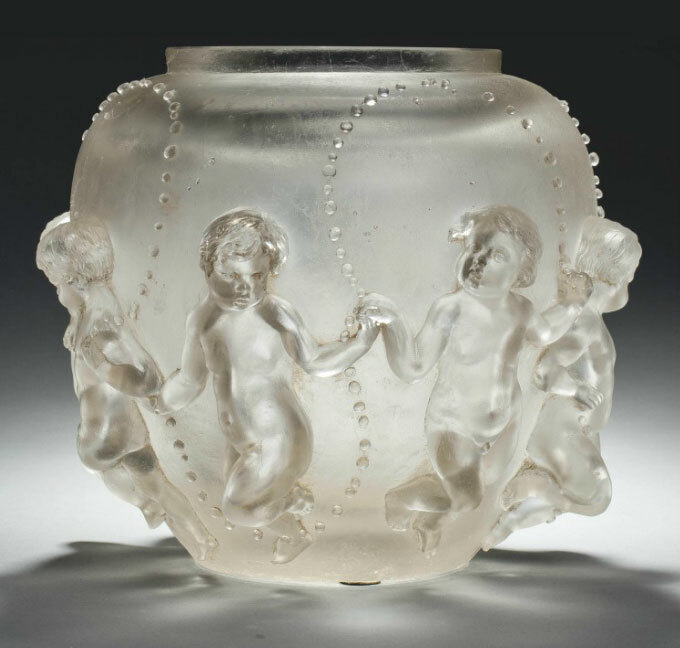 Top lot of the glass section of the sale was #153, an R. Lalique cire perdue vase from 1930, entitled Ronde D’Enfants, #5/5 from a small edition of five. It sold within its estimate of $200,000 – $300,000, realizing $290,500. The Lalique market, in general, appears solid, with good results worldwide for better vases. 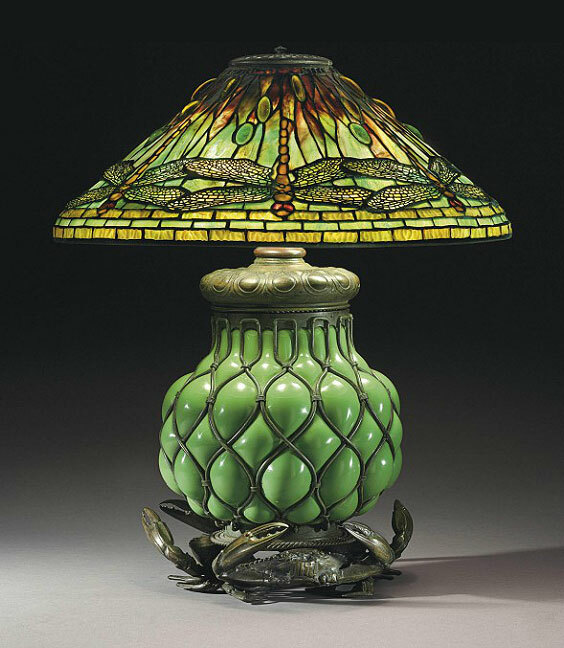 A wonderful Tiffany Studios 20″ diameter Dragonfly table lamp, lot #111, with a rare blownout crab base, was the lamp leader, selling for $266,500, against a pre-sale estimate of $100,000 – $150,000. Total sales were $8,821,337, roughly twice as much as Sotheby’s the day before, helped in no small part by the sale of the Noguchi table. For the complete results of the sale, click on the following link. Christie’s 20th Century sale results. Just prior to the Important 20th Century Decorative Art & Design sale, Christie’s conducted a one-owner sale of seven Tiffany Studios lamps. Results were less than stellar, with four of the seven lamps selling, including a very fine Wisteria lamp for $602,500. For the results of this sale, click on the following link. Christie’s Henry Africa’s lamps results. James D. Julia’s Important Lamp and Glass auction is happening today, Thursday, June 21, while Skinner’s 20th Century Design sale will happen this Saturday. After that we can expect a calmer July. June is Decorative Arts month at the nation’s auction houses. Every major and many not-so-major auction house holds one in June. I’ll cover many of them in the next few weeks, each Monday and Thursday. Today, it’s Sotheby’s turn. 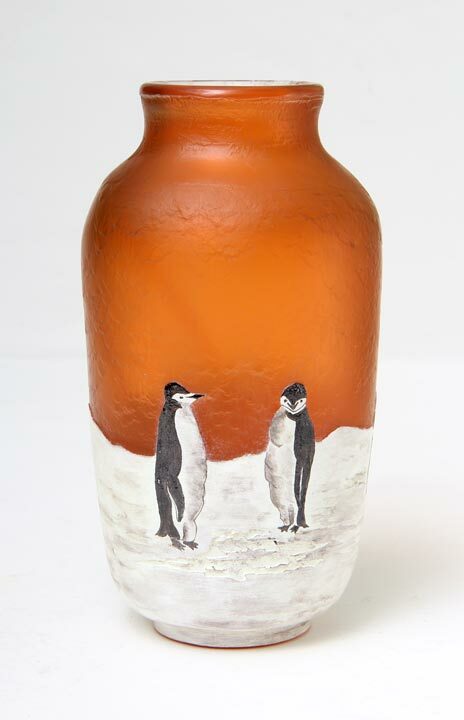 They held their New York Important 20th Century Design sale on June 13, 2012. Tiffany Studios table lamps and glass were the sale’s top sellers, with only one lot, a 1960s aluminum chair by Gerrit Rietveld, selling for more. 100% of the Tiffany lamps sold, with many exceeding their high estimates. 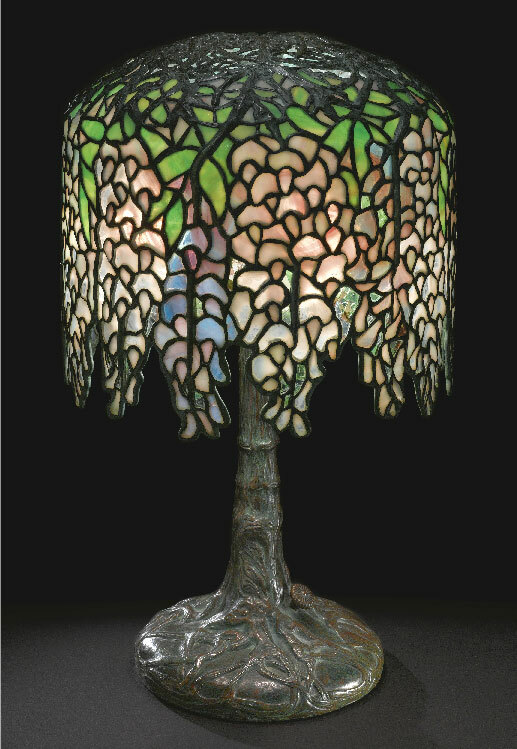 The top Tiffany Studios lot of the sale was #14, a Pony Wisteria lamp, which sold for $254,500, against a pre-sale estimate of $120,000 – $180,000. 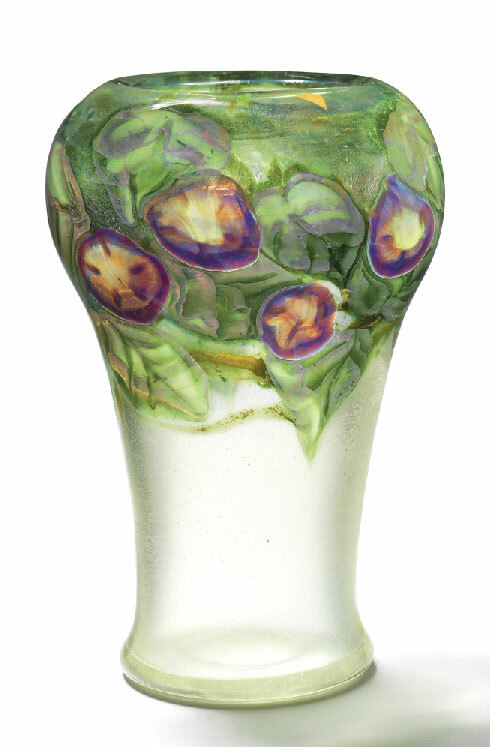 The top Tiffany Studios Favrile glass lot of the sale was #6, a beautiful paperweight vase with morning glory decoration. It sold for approximately double its low estimate, to reach $98,500. Total sales for the auction were $4,486,125, approximately half their December figures, as the December sales are usually larger and more important. For the complete results of the Sotheby’s sale, click on the following link. Sotheby’s 20th Century results. Still to come up are James D. Julia’s Important Lamp and Glass auction, this Wednesday and Thursday, as well as Skinner’s 20th Century Design sale this Saturday. After that we can expect a calmer July. Our next show won’t be until July, but we’re still very much in business. Don’t hesitate to call or write, and let me know what you’d like to buy, sell, or trade. 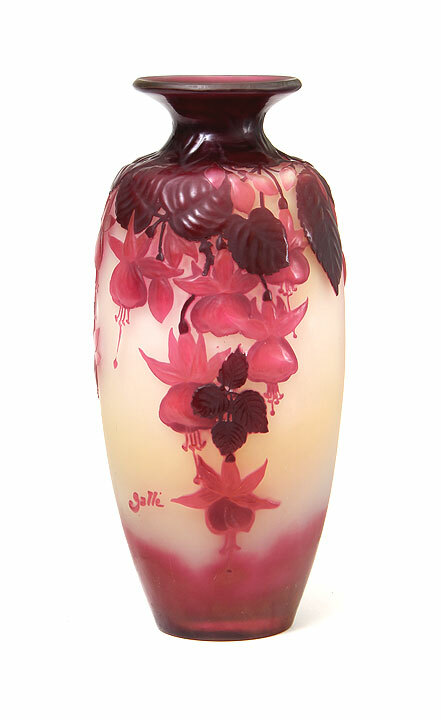 Doyle New York held its Belle Epoque sale on June 6, 2012, with Loetz glass leading the way. The art glass section of the auction was fairly weak, except for Loetz, which was well represented with a great collection that appeared to be from a single owner. The Loetz was estimated very conservatively, so the results easily surpassed their estimates for many lots. I tried to get a statement from the head of the department at Doyle, but unfortunately received no answer. Top results for the Loetz were shared by two lots, #s 581 and 583. Lot 581 was a rare black bottom vase that could have been estimated much higher than $1,000-1,500. It soared past its estimate to sell for $17,500 (including buyer’s premium). 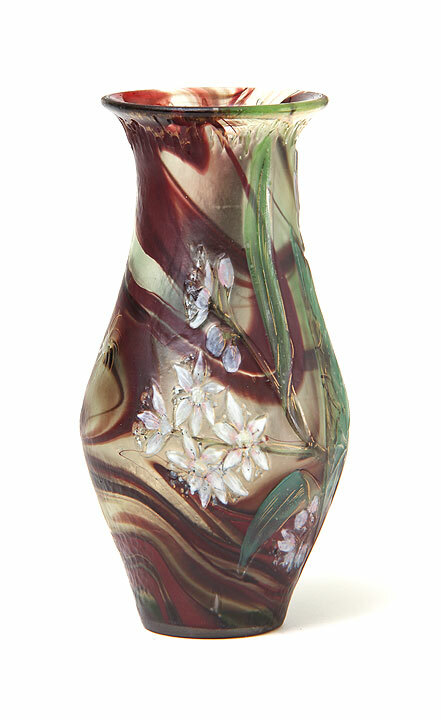 Two lots later, a gorgeous Loetz vase with very busy decoration of drips and zippers shared the spotlight with #581. It sold for the identical price of $17,500, against the same pre-sale estimate of $1,000 – $1,500. Only two other Loetz lots exceeded $10,000, but many surpassed $4,000. For the complete results of the entire Doyle Belle Epoque sale, click on the following link. Doyle’s Belle Epoque sale results. 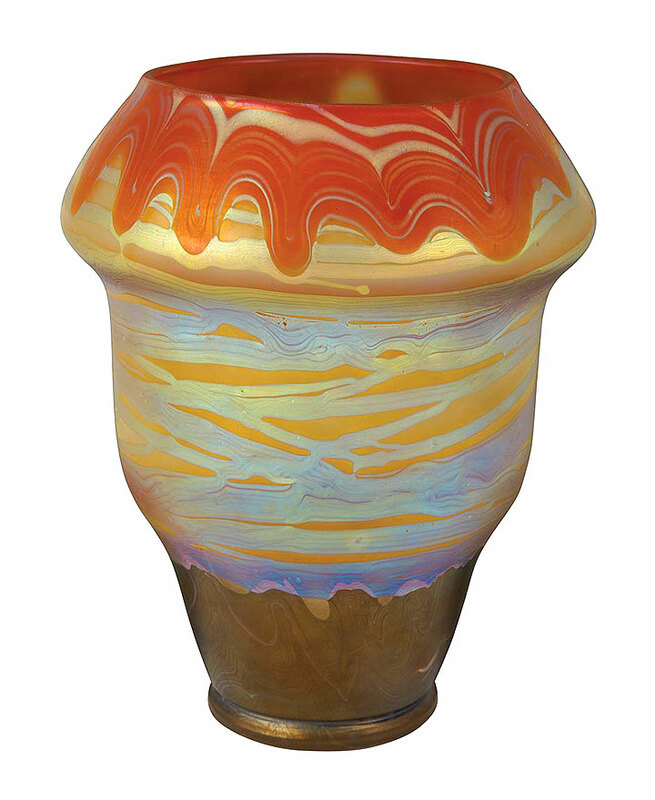 Humler & Nolan held their Rookwood XXII●Keramics 2012●Art Glass 2012 sale on June 2-3, 2012. There were some diverse results in the the art glass section of the auction (which is the only part I will cover). Following are the two highlights. 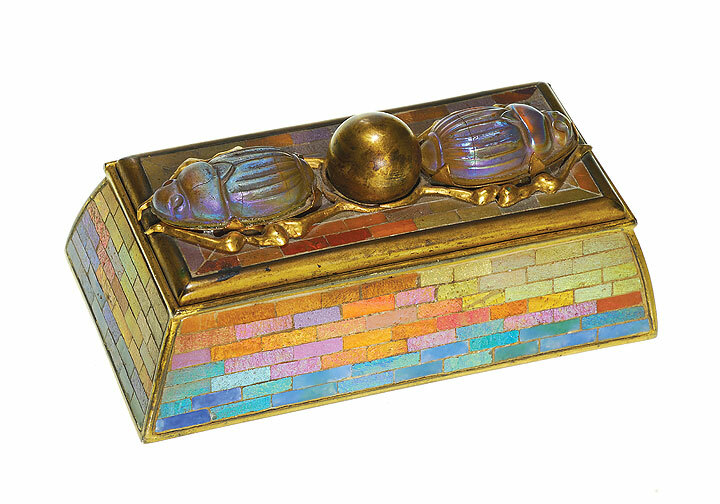 Lot #550A was a very rare Tiffany Studios mosaic tile stamp box with jeweled scarabs on the lid. Estimated to sell for $8,000 – $10,000, it soared to $34,220 (including buyer’s premium), as it should have. What a great box! I don’t have enough adjectives to describe how fantastic this box was. I’m not sure I would have been the successful buyer, but I might have been if I hadn’t been on vacation. I would have given the successful buyer a run for his money. Now for a Gallé vase that gets me ill. Not because there was anything wrong with it. Just the opposite. It was wonderful and sold for such a bargain that I’m speechless. 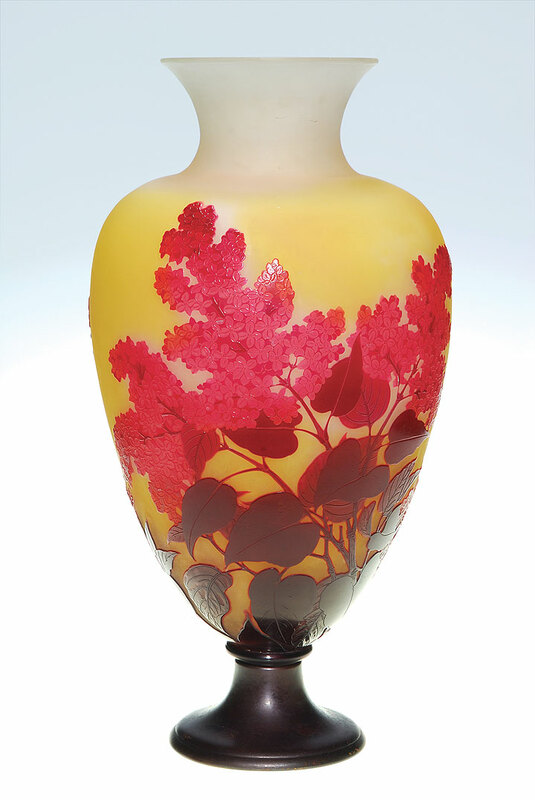 Lot #587 was a gorgeous, huge (19″), colorful Gallé vase with vivid red lilacs on a yellow background. It was estimated to sell for $6,000 – $8,000 and sold for only $5,900 (including buyer’s premium). This was easily a $15,000 vase, so my vacation cost me thousands more in lost profits. Every once in a while, something wonderful falls through the cracks and this was one of those times. For the complete results of the entire sale, click on the following link. Humler & Nolan results. Our next show won’t be until July, but we’re still very much in business. This coming week I’m going to list some new French glass purchases that are breathtaking, so make sure you check my website daily. Don’t hesitate to call or write, and let me know what you’d like to buy, sell, or trade.